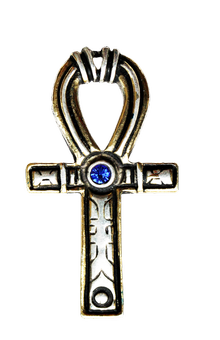 The Ankh represents living and Everlasting Life, not only in the material world but in the Spiritual Afterlife, and is the oldest and most sacred Egyptian Amulet. JA9 Mummy Locket - Protection from hidden dangers. Mummies of the Kings of Ancient Egypt were buried with many treasures in tombs that contained traps and dead end corridors to keep them safe from raids and danger. This Mummy Locket opens to show its contents, a hieroglyphic scroll for Protection from Hidden Danger. The Sacred Mask of the Tutankhamun’s sarcophagus is one of the most memorable images from the world of Ancient Egypt. 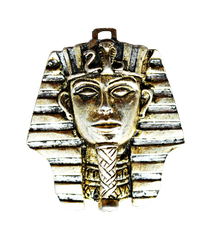 representing high Status both in this World and the next, the mask of the Boy King Tutankhamun is worn For Achievement of Goals. This stunning representation of the famed Ancient Egyptian Goddess Isis is beautifully crafted in pewter and finished in gold and silver, set with a brightly sparkling crystal. She was worshipped as the patron of Nature and Magic and so is worn for Magical Inspiration. 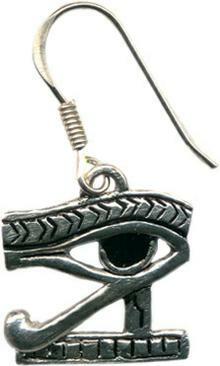 The Eye of Horus is worn to protect against Evil, symbolising the Power of Light over Darkness. 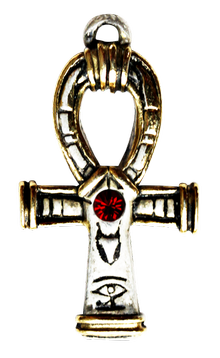 It is often seen as an amulet on Ancient Mummies to protect them in the Afterlife and so is worn For Health, Strength and Protection. Matching Earrings available, see JA7. 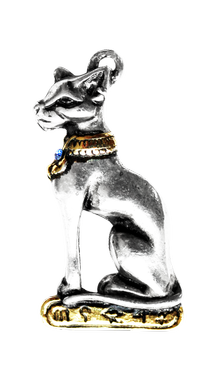 In ancient Egypt, figures of cats were offered to the Sun Goddess Bast at her temple at Bubastis to receive her blessings as Mistress of Music, Dance, Pleasure and Love. This beautiful pewter pendant is finished in silver and gold and is worn for Love and Happiness. 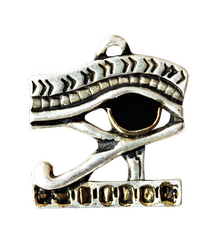 Legend has it that Wadjet was the daughter of Atum. 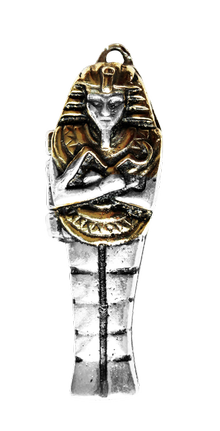 The Cobra Goddess “Wadjet” has guarded the Royal Kings and their treasures for over 3000 years and so is worn For Protection. 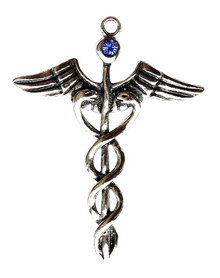 The Caduceus is a symbol of the Planet Mercury, and therefore is associated with the God Mercury, whose main attribute is Communication and Healing. 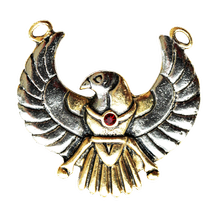 This Amulet is worn for gaining Wisdom and Communication Skills. 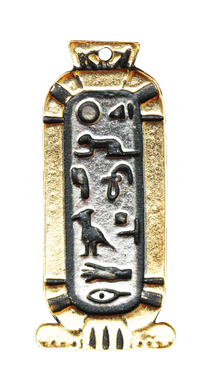 This detailed Love Cartouche incorporates a Powerful Magical Hieroglyph Charm dedicated to Cleopatra. 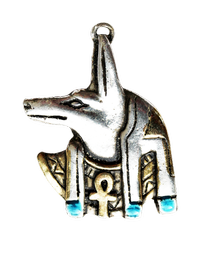 Anubis is depicted as a Man with the head of a Jackal and in Ancient Egypt he was believed to test the Worth of how you lived life on Earth by weighing your heart against the weight of a feather. Son of Isis and Osiris, Sun God Horus lent his image as a Falcon to the Hieroglyphic symbol meaning ‘God’ and many temples were dedicated in his Name. 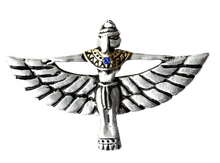 The Scarab was sacred to all Egyptian Sun Gods. 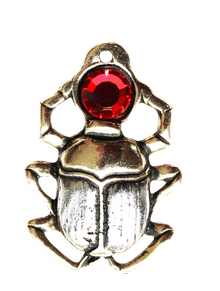 The Scarab Amulet provides the wearer with both the Protection of the Sun and its creative Life-Force. Osiris is one of the oldest Gods for whom records have been found dating back to 2,500 years BCE. 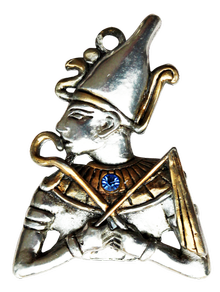 Holding the Crook and Flail and wearing the sacred white Crown of Upper Egypt, the God Osiris was Regent and Judge of the Underworld and so can be worn For Good Judgement.